﻿ Historic Fort Steuben - Ohio. Find It Here. 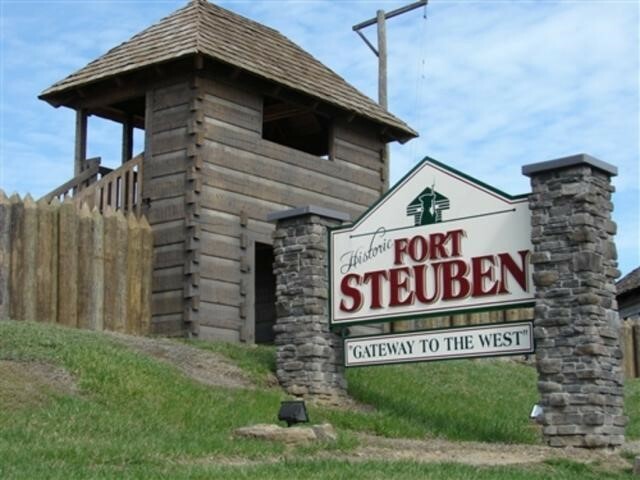 Historic Fort Steuben is a reconstructed 18th century fort built on the original site overlooking the Ohio River that opened the Northwest Territory to expansion and settlement. The 150 soldiers garrisoned in the fort protected the surveyors from hostile tribes as they laid out the first Seven Ranges of the Northwest Territory. Exhibits depict military and frontier life in 1787.An active archaeological dig is part of the tour. Buildings housing exhibits include the Hospital, the Officers' Quarters, the Enlisted Men's Quarters, the Blacksmith, the Quartermaster's, the Commissary, the Guardhouse and the Frontiersman's Camp. An 1830 Stone Survey Marker is also on the site. Tours of the nearby First Federal Land Office which served as a 19th century home office (originally built in 1801) can also be included.The Fort is open from mid-April through October. Special programs for students are offered in the summer and the fall. The Ohio Valley Frontier Days in early June include period reenactments, crafts, archaeological and surveying exhibits, food, demonstrations, music, lectures, and more. Wheelchair accessible.Visitors can explore the Museum Shop and obtain attraction and travel information in the Visitors Center all year. A variety of displays highlighting history and culture are exhibited throughout the year. The adjacent Fort Steuben Park includes the Veterans Memorial Fountain and the Berkman Amphitheater offering concerts and programs in season.